Drs. Brandon Ryff, Don Chiappetti, and Jonathan Coombs say the new location in Paradise Valley will open its doors on March 5th, 2018. Scottsdale, AZ – A well-known dental office in the Scottsdale area is moving to a new location. Scottsdale Smile Center will be relocating its services, in addition to its entire dental team, to a state-of-the-art facility just 1.5 miles from its current location. The new office in Paradise Valley, officially opening its doors on March 5th, is located at 5410 N. Scottsdale Road, Suite D-500. Patients of the practice can expect to see the same dental team they have become familiar with, as all of the doctors, hygienists, and support staff will be moving to the new office. 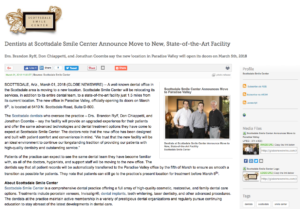 The dentists say that all patient records will be automatically transferred to the Paradise Valley office by the fifth of March to ensure as smooth a transition as possible for patients. They note that patients can still go to the practice’s present location for treatment before March 5th. Scottsdale Smile Center is a comprehensive dental practice offering a full array of high-quality cosmetic, restorative, and family dental care options. Treatments include porcelain veneers, Invisalign®, dental implants, teeth whitening, laser dentistry, and other advanced procedures. The dentists at the practice maintain active membership in a variety of prestigious dental organizations and regularly pursue continuing education to stay abreast of the latest developments in dental care.